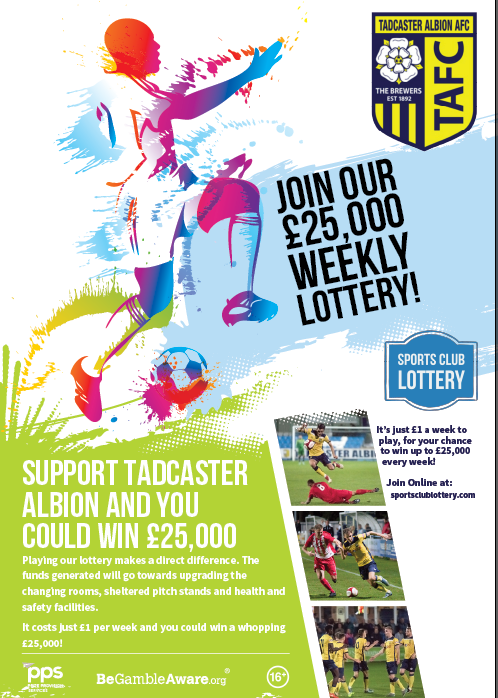 We are pleased to announce the launch of Tadcaster Albion’s very own lottery in which you could potentially win a whopping £25,000 jackpot! You can now support the Brewers by playing our brand new lottery which will help towards upgrading the changing rooms, sheltered pitch-side stands and health and safety improvements. You can play as little as £1 per week and when you join you’ll be entered into the draw for Tadcaster Albion. Please get involved, spread the word and maybe win some money!